This is the second of seven stories spotlighting historic Riverwest houses. Riverwest will be the featured neighborhood for Historic Milwaukee’s “Spaces and Traces” tour in May, 2011. In mathematical terms, an octagon is a polygon with eight sides. Insome beliefs, the octagon is a symbol that represents eternal life,probably since the number eight is symbolic of renewal. We see theoctagon in our everyday life in such things as stop signs, umbrellas,and church windows. Yet those are fairly common. For something a bit different, Riverwest offers an actual octagon house at 2443 N.Gordon Place. Though it’s not known precisely when this house was constructed, fair estimates date it sometime between in the 1850s or 1860s. 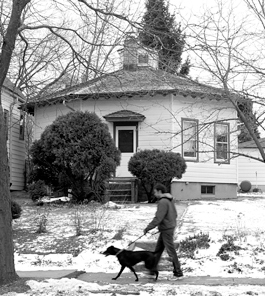 Taxrecords show that no structure stood at the site of the octagon houseprior to 1889, which means that this home was most likely constructed elsewhere – possibly along the Milwaukee River between East Clarke Street and East Center Street, or somewhere on Humboldt Boulevard, as theories have it – and later moved to its present site. James Dolphin, a Milwaukee artist, appears to have been one of the original owners of the house, though he never lived in it; he purchased the lot back in 1879 where the octagon house stands today. That lot and the area around it started seeing rapid development, and it’s likely that because of this growth, Dolphin had the house moved to its present location. John Osmanski, with his wife, Dorothea, were the first to rent the house from Dolphin. A few years later inDecember 1892, they bought the place for the sum of $800 – the amount many people today pay for a month’s rent for an apartment. AfterJohn died at the age of 77 in November 1909, his wife transferred the property to Anna Tadajewski toward the end of December 1909. Since that time, the house has gone through a number of owners throughout the years. Onesuch owner, Clarence Schultz, made some extensive renovations after he bought the place in 1949, bringing the place into the modern age and giving it more of the look you see today. He covered the outsidewith composition siding; he installed electricity for the first time; he even constructed a childrens playroom. While rehabbing the house, he also discovered some artifacts from previous occupants – such things as wooden shoes, old boots, and an old newspaper from the Civil War. What Schultz didn’t uncover, though, was the answer to the question, why an octagon? That would go back to before the Civil War to asecond-edition book by writer Orson Squire Fowler in 1853 with the rather lengthy and strange title, “A Home for All or the Grave lWall and Octagon Mode of Building New, Cheap, Convenient, Superior and Adapted to Rich and Poor.” It was Fowler’s belief that the octagon shape provided one-fifth more floor space than a traditional square-shaped house of fairly equal size. And because of the compact nature of the octagon shape, it was more energy efficient when itcame time to heat it. He also felt that the octagon more closelyresembled the sphere, thus providing greater natural beauty. It wasjust the perfect design in Fowler’s mind. Soon, octagon houses were springing up all over the country, built by loca lcarpenters and builders, who used Fowler’s book as inspiration. The bulk of these homes were built between 1848 and 1860. Interestin this design tapered off dramatically after that. Surprisingly, though, only two or three octagon houses were built in all of Milwaukee. Only one remains, and that’s the one in Riverwest tha tyou’ll be able to walk through and examine up close as part of the “Spaces and Traces Tour” by Historic Milwaukee. This one-dayevent will take place Saturday, May 21. For more information, including prices and ticket information, visit Historic Milwaukee online at historicmilwaukee.org.